The news cycle is crowded with significant events so we chose two for this week: Hurricane Michael & Jamal Khashoggi. These recent disasters deserve our concern and our scrutiny as citizens of the United States and the world. “One source says the report will likely conclude that the operation was carried out without clearance and transparency and that those involved will be held responsible. Why do hurricanes develop? What response can we make? What is the role of the federal government? What is FEMA? Do the number of hurricanes and weather events in 2018 suggest a pattern of change in climate? Do warmer oceans increase the danger that hurricanes pose? Might we expect additional weather catastrophes in the United States and around the world (reference Indonesia)? Is devastation the correct word to describe Hurricane Michael? What will be needed to restore basic needs in the states where Hurricane Michael struck? 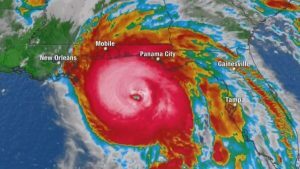 What are the long term human and economic consequences of Hurricane Michael? Who is Crown Prince Mohammed bin Salman (MBS)of Saudi Arabia? Why would Saudi Arabia want to eliminate a journalist who criticizes the royal family? What criticisms of the Saudi government has Mr. Khashoggi made? 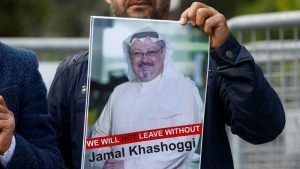 How does his disappearance affect the crucial role of the press and our relationship with Saudi Arabia? Since the location of Khashoggi’s disappearance and possible murder is Turkey, what complications does that bring? What do we lose when journalists are threatened? Does the fact that Mr. Khashoggi was a journalist for the Washington Post enhance our concern? Is this a human rights issue as well as a freedom of the press issue and or a foreign policy issue? What is the role of the President? Should the United States attend the International Conference on Economics and Finance in Saudi Arabia? What is the role of Congress? What does “stand up” to Saudi Arabia mean? Why are both these events newsworthy and important? What might be the economic impact of both Hurricane Michael and the disappearance of Jamal Khashoggi? What voice do citizens have to make a difference on both matters? 8.13 Explain how current and historical technological developments have influenced sustainability in the United States.